Blue Indigo Cottage Retreat Center's premium yoga and meditation program, set on their beautiful grounds, is the perfect way to reconnect with yourself. The busy lives you lead can so often take precedence over your own well-being, resulting in a feeling of imbalance and disconnection with your true self. Investing time in taking care of yourself, inside and out, is essential to your experience of the world and this is where Blue Indigo steps in to help you relax in a healthy and balanced way. You will be accommodated at Blue Indigo Cottage Retreat Center. Nestled in a tranquil area surrounded by trees and flowers, Blue Indigo Cottage Retreat Center is a beautiful and lovely retreat center in Siem Reap. There are two such types of rooms and each have an attached shower and bathroom. The same-gender dormitory has four comfortable beds, an attached bathroom, and is accentuated with wooden furniture. The wooden cottages are equipped with a big ceiling fan to keep the atmosphere cool, a lovely bathroom with shower, and a double bed with a mosquito net. In the center of the property, there is a 100 square meter yoga shala for yoga and meditation Theravada. This shala is built with traditional materials and is very well ventilated. As part of a premium yoga retreat program, Blue Indigo Cottage Retreat Center will provide all the support and guidance you need to reconnect, while giving you important personal space to reflect. 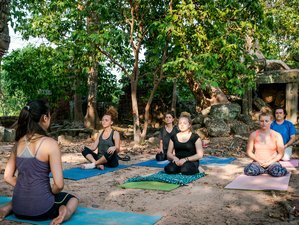 Relax in the shade of yoga and meditation shalas and enjoy the daily professional classes taught by experienced teachers. Blue Indigo Cottage Retreat Center is located 10 minutes away from Siem Reap’s riverside. Siem Reap is renowned for its magnificent temples. As the largest religious and spiritual monument known today, the area has a unique culture and vibration, with deep roots in Theravada Buddhism. You will experience that spiritual culture while practicing at the center or in the countryside, under the shade of centenary trees and archaeological wonders. During your stay, you will be served with daily nutritious and home-cooked vegetarian breakfast and lunch. All meals are shared in the garden, offering an occasion to socialize, a chance to bond and share stories with fellow guests and teachers. You will enjoy the friendly and relaxed atmosphere, simplicity, and friendship at no charge. This is the perfect break from all that inward self-reflection. The typical breakfast menu consists of toast, oats, home-made yogurt, home-made jam, fresh seasonal fruit, and tea. For lunch, it will be generally Cambodian-styled dishes, like rice, nutritious vegetables, and a seasonal fruit platter. During your free time, you may sign up for trekking tours and day trips, explore local Cambodian culture villages, visit the temple area and an amazing Angkor city, or you may also visit the Tonle Sap Lake with its floating villages. There will be time to walk or bike ride through the town. Rest, read a great book, chat with others, or just take in the gardens and natural environment as you experience some of the many yoga retreat lifestyle activities on offer. Please book your flight to arrive at Siem Reap International Airport (REP). Transfers from and to this airport are not provided. From Siem Reap International Airport (REP) to the retreat center you may take a tuktuk or a taxi. Blue Indigo Cottage Retreat Center offers a peaceful environment for you to learn or deepen your practice of meditation and yoga with health-oriented meals.